Starter kits are the backbone to any electronic cigarette system. It includes the tools needed to smoke successfully. The most basic starts kits just have your e-cigarette, a charger and a cartridge. More advanced ones obviously offer additional value via more e-cigs, as well as cases and even car adapters. 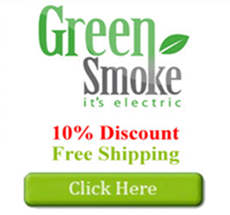 The good news is that even the cheapest Green Smoke starter kit offers an abundance, including 2 e-cigs (one regular, one USB), a pack of cartomizers, a home charging kit and a carrying case. That's not bad for $59.99. Use the coupon on the right and cut that down to about $55. There are certainly other options that add more -- more e-cig batteries, more carts and of course car adapters -- but I don't recommend them. If you want something extra, just buy it as a standalone product later on down the the road instead of spending an additional $100 on your starter kit. To review all the starter kits, please go direct to their website.